Paladins on the All-SoCon women's soccer team. Photo courtesy of Furman. 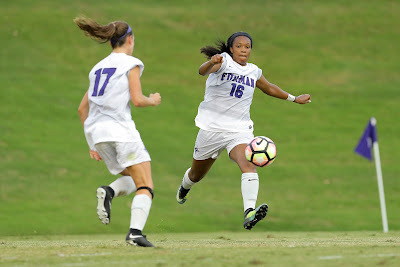 The Furman men and women’s soccer teams saw much success on the pitch this regular season, earning multiple accolades along the way. Both ended the regular season on the right foot entering Southern Conference Tournament play. The women captured their eighth regular season SoCon title, compiling a 13-2-2 overall mark and an 8-0-1 record in conference play. A school-record six players were selected to the All-SoCon team announced Tuesday. The Paladins finished the regular season on an 11-game unbeaten streak. Their only blemish coming in a tie against SoCon co-champ Samford in the final match of the regular season. But how Furman ended the year might be more impressive than the win-loss-tie column. The Paladins outscored opponents 24-1 during their unbeaten streak. One of the reasons for the scoring differential has been goalkeeper Kellsey Weaver, a sophomore from Newnan, Ga., who earned All-SoCon first team honors. Weaver was joined on All-SoCon first team by forward Molly Dwyer, midfielder Rachel Shah, defensive midfielder Sanon Williams, defender Jordan Evens and defender Quinn Lombard. Former Dorman High standout Mo Trnavsky represented the Paladins on the SoCon All-Freshman squad. Top-seeded Furman opened play in the SoCon women's tournament last Sunday at Stone Stadium with a 2-1 win over ETSU. After falling behind 1-0 on a penalty kick in the 21st minute, the Paladins answered. In the 34th minute, ETSU was whistled for a foul, just to the left of the 18-yard box. Shah stepped up to take the free kick and curled it inside the far post to even the score. Five minutes later, another ETSU foul resulted in another free kick just a few paces in front of the midfield stripe. Evans lofted the shot in the air, over the leaping heads of attackers and defenders, and into the net for the game-winning goal. The Paladins will face fourth-seeded Western Carolina Friday at 6 p.m. in the semifinals at Samford. The winner faces the Samford-UNCG winner in Sunday's championship. 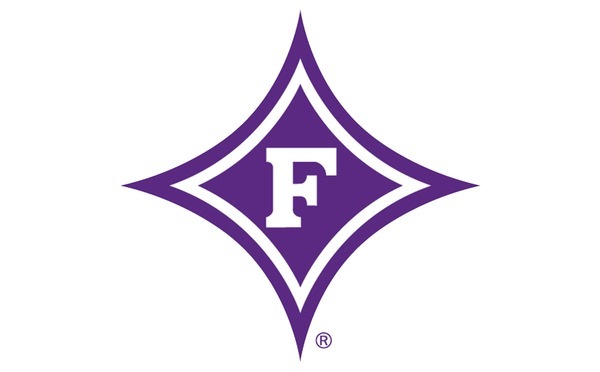 • Furman finished third in the men's standings this year at 5-2-3 in the conference. After starting the year 7-0 and ranked in the top 25, the Paladins (11-4-3) struggled in the middle of the season. They went 4-0-1 to close out the regular season though. During that stretch, Furman earned tough road wins against Mercer, 2-1, and Wofford, 2-0. A key switch was when Allsion moved senior Kevin Edelmann forward from his center back position. The move not only helped the defense, but the offense. Over their last five matches, the Paladins have scored 12 goals. Furman capped the regular season with a dramatic 2-1 victory over UNCG on Senior Day last Sunday night. Trailing 1-0 with 12 minutes remaining in regulation, Rocky Guerra settled the ball just beyond the 18-yard box on the right side. Guerra shot into the penalty area deflected off a UNCG defender then found the back of the net to help force overtime. In overtime, it took the Paladins just two minutes to find the winning goal. After a steal on defense, sophomore Emory May led a 3-1 breakaway. May led junior Josiah Baker with a pass into the box for the game-winning goal. Third-seeded Furman will open the SoCon men's tournament Saturday, hosting sixth-seeded VMI at 5 p.m. The winner will face No. 2 seed UNCG in the semifinal round on Nov. 10. Stone Stadium will serve as host site for the men's semifinals and championship. Note: The All-SoCon men's soccer selections and postseason awards will be announced next week.